Small Business Breakfast Bethesda , Feb 27th With Jill Schlesinger | Happenings, Marketing and Technology Advice and Thoughts! 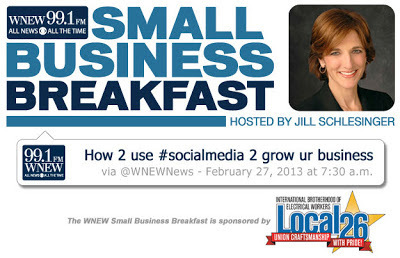 Jill Schlesinger, WNEW’s morning drive business expert and editor-at-large for CBS Moneywatch is hosting the Small Business Breakfast on Feb 27th at the Bethesda the topic "How to use #SocialMedia to Grow Your Business". I am thrilled to be a panelist and look forward to the event. Look forward to seeing you there. Place: Hyatt Regency in Bethesda, Md. Registration and networking starts at 7:30 a.m.